The Backstreet Boys first rose to fame in the early '90s with hits like "Everybody Backstreet's Back " and "I Want It That Way," and nearly 26 years later, their fan base is just as dedicated today. I first started listening to their music when I was six - Backstreet's Back was my first album and their Black & Blue Tour was my first concert - and I'm still rocking out, thanks to the band's latest album, DNA. Their music has stood the test of time as their fans have grown up with them - something the band is incredibly grateful for. "It's unbelievable for me because you start to realize that, number one, you've been around for a long time, and number two, you've done something impactful on this planet," Nick Carter told me as I sat down with the band on Jan. 28. "This is our tenth album, and did we ever think that we'd be here 25 years later? I mean, we'd hoped, but we were just living in the moment and enjoying everything. And now, it's here right, now." Carter elaborated on how crazy it is that their teenage fans from the '90s are now listening to their music with their children. "When you hear those stories, I compare it to when me when I would listen to certain bands, or my mom and dad would listen to groups, and then they passed it down to me. There's only a certain amount of groups or artists that can do that, and to be a part of that, sort of generational music , it's an honor." Part of their longtime success stems from how they've been able to reinvent themselves with each new era. After taking a short hiatus following their hit album Black & Blue in 2000, the band ventured away from their teen pop sound with their 2005 album, Never Gone. After Kevin Richardson left the group in 2006, the band switched up their signature five-part harmony as they continued on as a quartet for Unbreakable and This Is Us. They even added a nostalgic factor as they teamed up with New Kids on the Block to make a supergroup called NKOTBSB. And when Richardson rejoined the Backstreet Boys in 2012, they came back even stronger with their 2013 independent album, In a World Like This, which was primarily written by them. Now, the band is reinventing themselves yet again with their tenth album, DNA. While the album definitely feels reminiscent of their early '90s hits, it's still the perfect introduction to the new generation of Backstreet Boys fans. "We wanted to make something that could fit with what's happening right now, but not sound like everything out there," Richardson said about their mindset behind creating the new album. "So we took those sounds and the vibes that are out there and then put our twist on it with our five-part harmonies. And then we included our influences from R&B, country, pop, rock, and hip-hop and kind of mixed them all together." "We've seen all highs, lows, good, bad, and ugly together for almost 26 years." The theme of DNA is certainly fitting; as AJ McLean pointed out, most of them have been in the band for half of their lives. Being a part of the Backstreet Boys has shaped who they are as people. " We've been able to really experience life differently than just a person who's got like a nine-to-five that is sitting in a cubicle," McLean said. "I mean we're traveling the world, we're getting to see different cultures, different countries, experiencing different cuisines, meeting fans from countries that don't even speak English, but they know every single word to every single one of our songs. I think we've all become who we are because of our life experiences both individually or as a group. I mean we've seen all highs, lows, good, bad, and ugly together for almost 26 years." Not only has making music together had a big impact on their lives, but it's also affected their families. Now that all the members of the group are married with kids, they've been able to share this experience with them. "It's amazing," Howie Dorough said of his two kids. "I mean, sometimes I wish I was the son of a pop star. That's kind of a different, cool life. We've been able to enrich their lives by taking them with us around the world. We've given them an education outside of what they're getting in school, and world education is something you just can't buy or read in a textbook." In addition to widening their kids' horizons, having their children along for the ride has also renewed their own sense of wonder. "We've been blessed to have traveled the world a couple of times around, gone to some of these countries definitely more than sometimes you can count on two hands," Dorough added. "The first couple of times that we were in a few of these places, we were just like a kid in a candy store. We were like big tourists. But then after a while, little by little, you start losing the spark. And I think bringing our kids out, bringing our families out, and actually seeing it through their eyes and reliving that experience is really cool, because it also keeps it fresh for us." While the band has grown together as a family, Howie added, it's been an exciting change to bring their own families into the fold over the past few years. "Our wives and our kids really help us balance this, because this tour that we're getting to ready to embark on, we're going to be gone two months over in Europe. And then we'll be in the States two months. It's going to be a little bit of a long process, and without having the families there it can get a little lonely. We all started as just the five of us. When it was three of us living in an apartment together, we wouldn't be rushing to come back home. But now that we have our families, like the 'No Place' video, we can't wait to get back to home to our families." 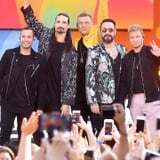 The Backstreet Boys are set to embark on their DNA World Tour in May, and they certainly have a big act to follow, literally. Following their successful Las Vegas residency which wraps up in April , the band is hoping to make their upcoming tour just as show-stopping. "We realize that a lot of our fans haven't had an opportunity to come to Vegas," Carter added. "We have, thankfully, a big fan base, but we know that they have probably seen this show through YouTube, or they've heard about it through the press, and wish that they could see a show of that caliber. So it is important for us to be able to bring something that's comparable to that. And we believe that we have that with the stage design that we're already working on right now. We know that we need to jam-pack the show with all the hits and singles that they love, and give them a certain amount of choreography that's nostalgic, and a production that is larger than life in a lot of ways. So with all of those in mind, we feel that we have something prepared that they are going to love." "We don't have any reason to be done. We have a reason to just get started again." Over the course of their career, the band has already accomplished so much - they're the best-selling boy band of all time, have multiple hit records, and have their own star on the Hollywood Walk of Fame - though they still have a few things on their "band bucket list" they'd like to cross off. In addition to touring in places like Africa or Greece, Richardson added he'd love for the Backstreet Boys to do a Christmas album which, same or maybe even an acoustic album featuring their greatest hits also same! . Of course, as Brian Littrell pointed out, it would also be nice to win a Grammy. The band is up for best pop duo performance for their single, "Don't Go Breaking My Heart," this year. "We've been nominated eight times, it'd be nice to have one," Littrell said before adding, "It doesn't define us as a band, but it would be nice." While we'll have to wait until Feb. 10 to see if that happens, rest assured that the Backstreet Boys aren't going anywhere anytime soon. "We're in this point where we like to move, we like to get out, we like to travel the world. We're used to it." Littrell said. "It's become part of our DNA where when we're home for two or three weeks, we're kind of itching to go back to work. As hard as we work for our families, we also know that this is what we belong doing. We've been doing it for a quarter of a century. So after Vegas is done, this is why it's such perfect timing to have a brand-new album with a brand-new show. Yes, you're going to see some of the iconic choreography that you saw when you were six, and you'll probably be dancing with us in the audience, but you're also going to get catapulted into the future of where you are now and knowing the DNA record and going, 'Wow. These guys aren't even close to being done.' We don't have any reason to be done. We have a reason to just get started again." The Backstreet Boys were a huge part of my childhood, but it's even more special knowing that they will continue to be a huge part of my adulthood. While their legacy as a '90s boy band will always be iconic, what's truly remarkable is how they've managed to bounce back time and time again and come back stronger than ever. In the meantime, I'll just be not-so-patiently waiting for that Christmas album to drop.